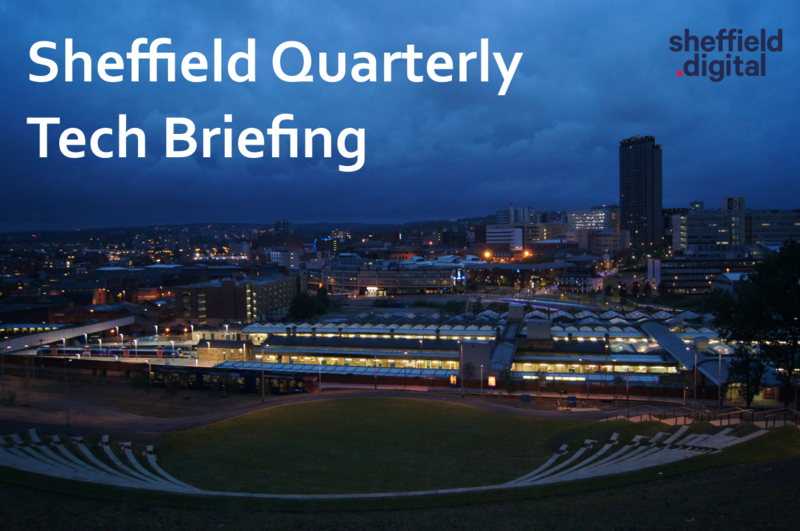 Sheffield Quarterly Tech Briefings – design partner wanted! Design our new regular briefing document to inform policy makers and leaders at national and regional level about Sheffield's digital tech industry. As many of our members will know, it’s long been an ambition of ours to produce a regular briefing of the Sheffield digital tech cluster aimed at policy makers and business leaders at national, regional and local levels. In pursuit of this, we now have a plan in place, along with a small pot of seed funding from Sheffield City Council, to get a prototype off the ground and help us to produce the first two issues. In order to do this, we need some design help and are looking to partner with someone who can offer us in-kind support in return for credit or sponsorship. To make the publication sustainable, the intention is for each edition to be supported by sponsorship contributions, in the region of £400 per sponsor, per edition. Alternatively, we can offer the design partner a production credit separate to the ‘sponsored by’ branding. So, this partner could be a freelance designer or small studio, but is more likely to be the design department of a larger firm who can second a designer for a few days in exchange for a period of sponsorship – we are open to negotiation on this. This is intended as a high quality, significant and prestigious media initiative, which will reach a very specific and high-value audience. If this is of interest, please get in touch with Chris to discuss it in more detail. Do read the detail below, as we don’t see this as ‘your average design job’. It will be a challenge to get right in the way we envisage it, but a very good challenge! The overarching purpose of the publication is to generate a steady drum beat of information about Sheffield’s digital technology cluster in the minds of leaders across public, private and academic sectors, at local, regional, national and international level. Regularly draw attention to our digital tech sector, and increase mindshare. Furnish leaders with basic information about the cluster, including economic figures, geographies, major sub-sectors, firms and support organisations. Define and declare the current policy priorities, providing a clear call to action for policy-makers and lobbyists. Demonstrate the maturity of the local digital technology industry in the quality of the publication and its content, and in the support of sponsors. Members of Parliament with responsibilities for the economy. Officials at National Government departments and support organisations, e.g. DCMS, BEIS, UKTI, Tech Nation, the Digital Catapult, Innovate UK, etc. Local policy-makers and elected officials at the Council, Growth Sheffield, Invest Sheffield, Sheffield City Region Combined Authority, Local Enterprise Partnership and Metro-Mayor’s Office. Leaders of local anchor institutions, e.g. the Universities, NHS Trusts, etc. Local digital businesses and support organisations. Members of the Press (national and local). Generally Interested members of the public. In addition, we expect the publication to be passed to organisations who are looking at the potential to invest in, or relocate to, the city. We expect these people to come into contact with the briefing online, or by referral from the primary audience, or simply through serendipitous contact with a physical copy of the publication. 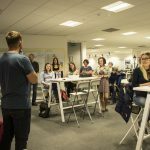 Sheffield Digital represents the digital technology industry in Sheffield and the immediately surrounding area. We also have a partnership relationship with the Barnsley Digital Media Centre. Our focus is to concentrate on the city, but to not be exclusive – we will work with other parts of the region, welcome members from outside Sheffield and will happily promote events and initiatives from across the Sheffield City Region when asked. We expect the same to be true of the briefing, however in the first instance it will be focused on Sheffield. If there is a desire and support to extend the geography to the City Region this will happen at a future date. Web pages linked from email and social media. Individual social media posts using images, links and threaded lists. Certain pieces of content will be provided by regular partners. These partners will be listed in the credits and will also have their branding shown alongside the content in question. Each of these content components will be submitted in a standard way and to a defined deadline each quarter. Our expectation is that these content partners will provide this content free of charge and to the agreed plan, in return for being designated as content partners. Our approach is to develop a high-quality prototype, incorporating the initial publication design and layouts, and recording initial ‘1st run’ estimates of stages in the content submission, editing and production process across all formats. We intend this prototype to be prepared ‘ready for publication’ for the end of April 2019. At this point a decision will be taken amongst the partners and sponsors whether to publish this prototype edition or not. In addition to the visual aesthetics, the design process will need to account for the efficient provision of content from multiple partners, the ability to re-purpose the content into multiple formats, and perhaps most crucially the ability to produce future editions without needing the continual involvement of the designer in every issue. In order to achieve this, it may be that the entire publication is built from custom templates and assets in a collaborative tool such as Canva or similar. The masthead will show the title, edition and the “quarterly focus” topic. The Masthead will include the Sheffield Digital logo and the style will reflect Sheffield Digital’s branding. This will be an editorial article. Our intention is to invite different people in the local ecosystem to write this each quarter. The article should look back at the previous period and ahead to the next, referencing (linking to) key people, firms and events, etc. while also reflecting on where we are as a cluster generally. The editorial will also carry a photo of the author. This section will show top-line economic figures for the Sheffield digital tech cluster, along with the date or date range covered by the figure. Overall size of the cluster in terms of employment, turnover and GVA (per Tech Nation). This section will recap the major news stories that broke within the last period, focusing on new arrivals, acquisitions, major product launches and ecosystem events. These will consist of headlines and short snippets, we anticipate 4-6 major headlines in each issue. Digital versions will include links, of course. This section shows major upcoming launch dates and events. This section shows the currently most significant challenges and priorities facing the local digital technology industry. These should be strategic and few in number – no more than 5. They may well not change for long periods of time. Their inclusion here serves to keep minds focused on what the priorities are. These priorities will be produced in collaboration with Sheffield’s digital community, our membership and partners and fora such as the economy.SHF steering group. This section contains information about all the producers and partner organisations involved in the production of this issue, along with logos. The “Quarterly Focus” will likely span several pages of the publication and look at a different aspect of Sheffield’s digital tech cluster each edition. Sub-sectoral – i.e. looking at one of the major local sub-sectors such as Video Games, Robotics, Digital Manufacturing, Data Analytics and Simulation, Digital Arts and Culture or Cyber Security, etc. Illuminating – i.e. looking at a particular feature of the local digital tech cluster, such as major meetups, women and minorities, mid-stage or high-growth startups, the talent pipeline, etc. “Top 10” lists – i.e. where appropriate, the focus can be on entities which can be ranked, for instance the largest employers in the cluster, or the fastest growing, etc. This section provides leaders with more insight and awareness of key aspects and important people and entities within the cluster, as well as providing a significant area of difference from edition to edition. This section shows each of the entities highlighted in the Quarterly Focus as individual segments or “boxes”. Each of these entities will also be used in a Twitter thread showing the quarterly focus list in that format. We envisage a ‘quick facts’ section somewhere, for instance as a footer or sidebar, containing incidental pieces of information about Sheffield’s Digital Technology industry. These are intended to be generic, and not necessarily related to the Quarterly Topic. The section provides space for additional tidbits of information and facts that otherwise have no good home in the rest of the briefing. This is a graphical map showing the geography of Sheffield’s digital tech cluster, including standard features and landmarks, as well as callouts specific to the Quarterly Focus. The map should show the compact nature of Sheffield’s cluster, particularly the crescent stretching from Neepsend through Kelham to Castle Gate, and to the Sheaf Valley, Digital Campus, Knowledge Gateway and Cultural Industries Quarter. In addition, the map should highlight the extent of the city centre that is made up by the two Universities, as well as the Sheffield College and University Technical Colleges. It may be that there will need to be several nested maps showing different scales in order to appropriately locate readers, especially if the geography is extended to include the wider region (in which case this may need to be a series of maps showing at minimum Barnsley and Doncaster, in addition to Sheffield and the Rotherham corridor). The purpose of this map is to provide leaders and potential investors or relocating firms with an easy overview of the local geography – and an appreciation of how close together much of the industry is especially with regard to transport, university research and skills development. This section contains the legend for the map section, including additional information about key entities within the cluster. This could be separate or integrated with the map, depending on the design. It should also be noted that although some aspects of the map may change between editions to reflect the Quarterly Focus, the intention is that the basic design assets will not need to be changed or incur significant additional expense between editions. This section reiterates the credits from the front page with more space to display logos and short descriptions or straplines, links, etc. In the print version, this section should also contain short links to the online versions of the edition and the archive. 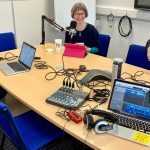 14 – What is the Digital Tech Industry? This section should contains a simple definition of what we understand the Digital Technology industry to mean, taken from definitions used by Tech Nation and DCMS, including the distinction between the digital industry and the digital economy, along with examples of the kinds of business that qualify. This section should contain any necessary footnote references from the Headline Economic Figures and any other references contained in the briefing. That’s our thinking so far. We’re hoping to work with an experienced designer who can translate concepts into online and print, and who is creative as well as being flexible, especially when it comes to trade offs between ease of reproduction and outright quality. We want to make this compelling but also quick and low cost to produce new editions every three months. If you want to contribute to this, have a slightly under-utilised design team, or see this as a great opportunity for training and development (which it is) then please get in touch! Part 2 of this series takes a look at the underlying data and methods used in the report.